An unreal Cork is the scenario for the darkly picaresque adventures of the two protagonists: born on the same day, Runt and Pig have grown up developing a close secret world of their own with its own language and, in their opinion, its own explosive rules. Two outsiders, two rebels without a cause in the club culture era. John Haidar’s work is philologically flawless. Runt and Pig are two lost souls looking for comfort, fondness and, in the end, love – like almost everyone else – but without knowing how to deal with emotions. His direction is the visual echo of that urgency: extremely physical, strong and crazily nervous, thanks also to Naomi Said’s movement direction. 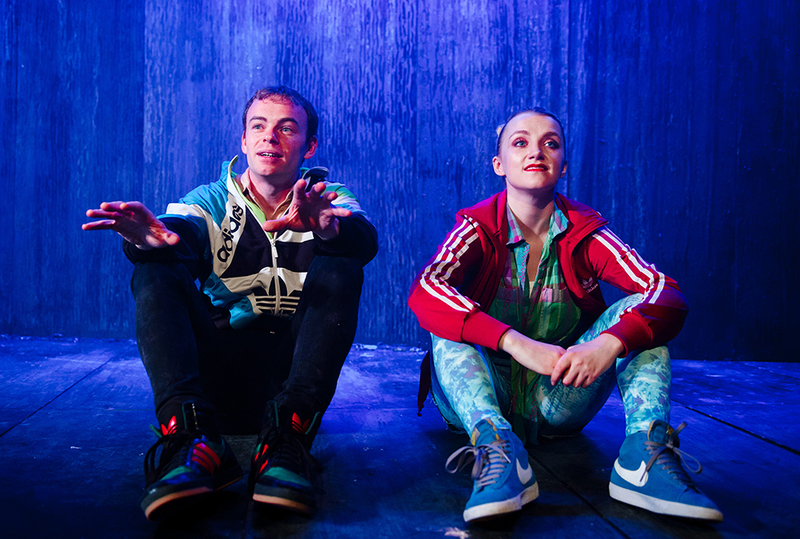 But the two performances are the true highlights of this celebratory production: Evanna Lynch as Runt and Colin Campbell as Pig are a dazzling mix of chemistry, energy and, even, tenderness. Lynch’s portrait of Runt is a fascinating and intense journey into awareness: her life could be different, their small co-dependent world might be a cage, when the line between childhood/adolescence and adulthood is crossed the worlds may clash. Her line, “Jarr my life, Pig” at the beginning of the play, said with dreamy eyes, is not so true at the end. Campbell’s Pig is astonishingly energetic. He dictates the syncopated rhythm of the show with a performance able to “dance” through tenderness, anger and madness at the same time, proving to be unmissable. His disco dance “round-up” is one of the most brilliant moments of show thanks to Elliot Griggs’ terrific work as lighting designer. This production is a dynamic and immaculate celebration of the 1997 Disco Pigs, It succeeds in telling that story without really adding anything for a new, more contemporary reading. But it definitely deserves to be seen thanks to the two superb performances and the strikingly engaging soundtrack. Disco Pigs runs through August 19.